The final Wes Anderson film I hadn’t seen, and definitely one of my favourites after a journey through his filmography. It’s different in many ways from his other output, with it being animated and based on a novel, but it’s still quintessentially a Wes Anderson film, full of his particular style. 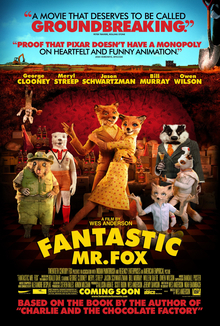 Based on the Roald Dahl novel (which I’ve not read since I was a kid), it tells the story of a fox, who angers three farmers when he tries to steal from them, and ends up having to tunnel underground to escape from them. Roald Dahl was a very quirky author, and his writing style is a perfect match for Anderson’s style of filmmaking, and he brings the story to life superbly. The use of stop motion as the animation choice works really well for the story and adds to the overall effect, with the king of stop motion, Henry Selick starting the work that Mark Gustafson would finish. Initially, it’s a little strange hearing famous voices like George Clooney and Meryl Streep voicing the main characters (which is unusual, given most animated films have some famous voices), but once the story starts to take over they seem a little less obvious. The voice cast is made up primarily of Anderson regulars who successfully bring to the life the eccentric characters from Dahl’s story. It’s a very funny film, and it’s a real joy watching the little schemes Fox draws up to stay one step ahead of the furious farmers. Meticulously crafted by the animation directors and Anderson himself, this shows that he has an uncanny knack for animation without sacrificing his own artistic style, and I would love to see him try his hand at adapting more films that aren’t based on his own original screenplays – perhaps even more of Dahl’s wonderful collection. The final film in the Wes Anderson retrospective will be Moonrise Kingdom, which I have seen before, but will watch again over this coming week. From my recollections, it’s probably my favourite from his output.